You can subscribe to my videos here. The Green Miles' appearance on CleanSkies.TV aired on Sunday morning on WJLA-TV/ABC7 here in DC. You can watch it online by going to this page, clicking on "Clean Skies Sunday," then clicking on "Policy & Its Effect" (I wish there was a direct link but that seems to be the only way). My segment starts at 15:57. Let me know what you think! So I was planning to do a big post to compile in one simple, easy to read list all the tips to improve your gas mileage (and by extension reduce your carbon footprint). But it turns out someone already did it. Should I be happy or jealous? Air conditioning can reduce mileage significantly, by as much as 20%. In fact, your air conditioner can consume up to one gallon of gas per tank to cool the vehicle. But driving with your windows open can produce aerodynamic drag, which reduces fuel economy. What's a driver to do? When driving at slower speeds (less than 40 mph), such as driving in urban areas, open windows are better. At higher speeds (over 40 mph), open windows use more fuel than the air conditioner, so close the windows and turn on the air conditioner. Another good idea is to take advantage of the "recycle inside air" feature. The air that is already cooled in the car is reused by the air conditioning system, instead of drawing hot air from the outside to be cooled. Are there any tips they miss? Here's an example of why we treehuggers get so riled up about bottled water. It's not just that bottled water trucked in from a remote location has a a huge carbon footprint. It's that bottled water may not be any better for you than tap water. Just a couple of quick notes from the train ride home. Amtrak not only serves Green Mountain Coffee, they have a wide selection of organic snacks available. 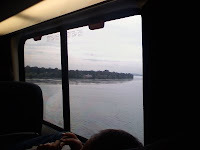 Very nice to see and makes me want to keep riding Amtrak (though it would make me want to ride even more if they had free WiFi). It was also nice that the cafe car server accepted my reusable mug. The last time I took an Amtrak train, the server refused to take my mug, saying, "I don't want my bosses to accuse me of stealing." I guess he wanted to make sure he gave out a paper cup for every cup of coffee sold? My reusable mug also came in handy at Amtrak's tiny water dispensers. The only way to get water out of them is by filling miniature paper cones that hold about one gulp of water. So kept refilling the cone and dumping the water into my mug, it saved me quite a few trips to the water dispenser. I'm on the Acela heading up to Boston today to catch the Red Sox-Indians game at Fenway Park (named this spring as one of The Green Miles' Green Diamonds). I deliberately planned the trip to minimize cost and maximize convenience. I'm taking the Acela to Boston's Back Bay Station, which is walking distance from my hotel, which is walking distance from Fenway Park. This weekend I'll be staying with my dad in Quincy, MA, on an MBTA bus route that runs at least twice an hour, much more during peak times. So instead of spending $125 for three days of a compact rental car ... plus gas ... plus parking ... I'll spend $20 on fares via a Charlie Card, the T's version of a Metro card. And oh, I almost forgot, I'll be slashing the carbon footprint of my trip. Here's one (admittedly inexact) graph of carbon dioxide emissions per passenger by transportation source. The flight emissions are actually much worse than ground-level transportation because planes deliver their pollution directly to the upper levels of the atmosphere, where they can do the most damage. Sure, the train takes a bit longer. But I have my laptop and wireless card and I'm getting work done. I'm enjoying the great views of the Atlantic coast. And I'm avoiding having to deal with airport security and cramming my items into a quart-sized Ziploc bag and squeezing my 6-foot self into a seat made for someone 5-10 or under and the labyrinthine Escape from Logan. What kind of a price tag can we put on those savings? The Green Miles will be on Clean Skies Sunday this week talking about energy legislation. You can watch the program here in the DC area on Sunday at 9:30am on WJLA-TV (ABC7). I'll post the video here as soon as it's online. Already flowing in DC at: Rocket Bar, Tryst, Open City, Wonderland Ballroom, J. Paul's, Hook, Oceanaire, Les Halles, Cafe Saint Ex, Busboys, Ulah Bistro, The Reef, Kramerbooks, if you know any of those spots. Let me know if you would like it served at a particular spot or think it would do well, I will certainly try to get it on tap anywhere I can. Super tasty on draft, not sure if you have tried it. Please request Peak anywhere you drink/dine. It really makes a huge difference when customers put in a good word. What other places in Arlington would you like to see organic beer on tap? Let's give this one the Ms. Jackson Memorial "You Can Plan a Pretty Picnic but You Can't Predict the Weather" Award. It wasn't such a great World Carfree Day 2008 on the Orange Line this morning. As I was waiting at Ballston to catch a train out to West Falls Church, I noticed the other side of the platform was much more crowded than usual with people waiting for a train into DC. Sure enough, when I got to work, several friends instant messaged me to say that a broken down train between Rosslyn and Foggy Bottom had slowed their commute into DC by as much as 40 minutes. Can we finally give Metro the dedicated funding it needs to keep the system in working order? Kaine Looking to Cut a Deal on Smoking? Now, as 2008 winds down and we move closer to the last General Assembly session of Tim Kaine's governorship, this issue is back. Unfortunately, this time around, I'm hearing that Kaine is going to push for a half-measure that's worse than doing nothing at all: no smoking in restaurants, but only before 10 pm. After that, you can light 'em up! What I'm hearing is that Health and Human Services Secretary Marilyn Tavenner is currently pushing for this utterly ridiculous approach, despite vehement opposition from public health advocates. Why is Gov. Kaine, who's been excellent this issue, going this route? Sadly, what I'm hearing is that Kaine has decided that getting something is better than nothing on this issue. One source puts it this way: "This is as weak and mealy mouthed as you can get, but Tim Kaine wants to be able to say he accomplished something on this, because he certainly hasn't yet." The problem is that if this completely inadequate legislation goes through, it will most likely mean no REAL action on a comprehensive smoking ban in Virginia for many, many years. Essentially, the politicians will be able to pat themselves on the back and say, "hey, we accomplished something!" Except that they really won't have; I mean, what's the point if everyone can start smoking again after 10 pm? Stupid. I'd rather put up a full ban and lose than have some half-measure like this. With even places like Clarendon Grill voluntarily going smoke-free, the pressure is on smoking ban opponents to defend their continued blind allegiance to Big Tobacco. Just a quick reminder that Monday September 22nd is World Carfree Day 2008! If you usually drive to work but there are public transportation or carpooling options available, here's a day to give one of those a try. The Green Miles will be taking a Metro rail then bus out to work in Reston tomorrow. Takes a little longer, but saves money on gas, lets me catch up on reading, and saves me a big headache battling traffic on I66 and the Dulles Toll Road. A Beer That's Local AND Organic? We've had a lot of serious discussion about major political and economic issues this week. But I feel strongly that it's time to get back to what really gets me motivated to blog every day: An excuse to try new beer. The production breweries in the area are great, too. Currently, I’m excited about the Oxford Organic Raspberry Wheat from Clipper City. I'm not usually a fan of beer with a fruity flavor, but the Oxford Organic Raspberry Wheat's raspberry was relatively understated. I wished I'd found it at the beginning of summer, would've made a great backyard beer. And how great is the little "USDA Organic" seal at the top of the tap? Boulevard Woodgrill always has a great selection of beer, but the real mecca of organic beer in Arlington is Busboys & Poets. 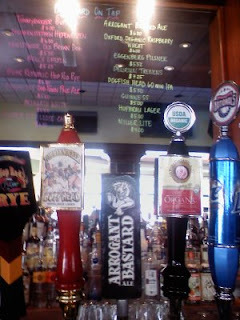 They have Clipper City, Peak, Stonemill and Wolaver -- and they're half price on their Wednesday organic beer happy hour. If you're looking for organic beer when you're out in Arlington, stop by Lost Dog Cafe, which has several organic and plenty of local options, or Tallula's EatBar, which has Samuel Smith Organic Lager (although it's way overpriced at $11.50 a bottle). Ted's Montana Grill used to have organic beer, but I don't think I saw it on the menu last time I was there. Any others in Arlington I'm missing? General Motors Vice Chairman of Global Product Development Bob Lutz was just on The Colbert Report blaming global warming on sunspots and dissing his own Chevrolet Volt as a weak, unattractive car. I'll post the video here as soon as it's online. UPDATE: Here's the video. Note to Bob for future reference - if you're going to greenwash, it's best not to come right out and deny the scientific consensus on global warming with a made-up number of people who believe in a kooky denial scheme. Kind of undercuts your alleged green credentials. We Want More Efficient Cars. Does Detroit Get It? If you're a YouTube user, you can subscribe to my videos here. And if you like the shirt, head over to BustedTees.com. In addition, check out the schedule for the Chesapeake Climate Action Network's Wise Energy Tour in Northern Virginia. If Democrats Won't Green Their Events, Who Will? Former Virginia Governor and current candidate for U.S. Senate Mark Warner held his "almost annual" pig roast at his farm in King George this weekend. You can read a full review over at VirginiaDem.org. No recycling at Mark Warner Pig Roast. Whenever I see Ben, the blogger who writes Not Larry Sabato, he never fails to rub it in The Green Miles' face that he has a smaller carbon footprint than I do. (I have to carpool to an office out in Reston two days a week while Ben doesn't even own a car. Although I wonder how many flights a year he takes? We may need to do a The Green Miles vs. Not Larry Sabato carbon weigh-in. Where was I?) Anyway, I'm not surprised Ben was watching out for a green faux pas. I saw some half-hearted eco-efforts myself at the Arlington Democrats Chili Cookoff on Labor Day. There was recycling and several of the cooks prepared vegetarian chili or used locally-grown ingredients. But there were also plastic forks, styrofoam bowls and napkins and fliers not made out of recycled material. Eco-friendly alternatives are available at just about every grocery store in the DC area these days, so there's no excuse for not buying green. Most hypocritical -- ice chests of bottled water. The Cookoff took place at the Lyon Park Community Center, which has a kitchen with running water. Democrats on the Arlington County Board have pledged to avoid bottled water whenever possible and county agencies have done a great job of following through. 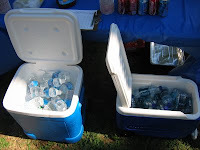 So why is bottled water unacceptable at county events, but made available at virtually every Arlington Democrats event? I don't want to sound like a nattering nabob of negativism. National Democrats certainly broke new ground on holding a sustainable event with their extensive efforts to green the Democratic National Convention. And if we're going to pass legislation to slow climate change and make America more energy independent next year, it's Democrats like Mark Warner who are going to make it happen. But here's the thing -- consumers don't change habits easily. They need to be shown that going green is both important and hassle-free (which is one of the reasons I started this here blog). Every time you bust out the bottled water, you're sending uncertain consumers a subtle message this all that green stuff is just a fad -- it's OK to fall back into those old habits at the first sign of possible inconvenience. The bottom line is, if you're going to talk the talk on going green, you have to walk the walk. If Democrats won't take every reasonable step to green their events, who will? When Congress was looking to tighten fuel economy standards last fall, the Big Three automakers launched a massive push to fight the effort. We don't need more big government regulation! Let the free market decide! Even before top industry executives arrive in Washington later this month to lobby for their program, General Motors' vice chairman, Robert Lutz, who never misses an opportunity to put his foot in his mouth, was telling reporters in Chicago last week that the industry "deserves" government loans because of all the challenges that have been inflicted upon it. In fact, it's hard to imagine an industry less deserving of government help. Here are three companies that for decades failed to produce cars that were well designed, well produced and exciting to look at, that fought tooth and nail against efforts to require greater fuel efficiency and, until recently, did too little to bring wages, benefits and retiree costs in line with competitive realities. And while they whined for years that it was unfair trade that put them at a disadvantage, Toyota, Honda, BMW and other foreign transplants came along to prove that it is possible to produce quality cars at affordable prices in U.S. factories while offering decent wages and benefits. Pearlstein goes on to say that even though the Big Three couldn't be less deserving of help, they should get it anyway because the jobs and pensions of hundreds of thousands of Americans are at stake. I agree with Pearlstein that we need to do what we can to make sure workers and retirees aren't punished for the mistakes of auto industry executives. But the utter incompetence of those executives is just breathtaking, isn't it? They staked the industry's entire future on never-ending cheap gas. Did any reasonable person ever think $2 a gallon gas was a permanent fixture? Expensive petroleum is here to stay. The only way alternative is to use less petroleum with more fuel efficient cars, plug-in hybrids, and eventually fully electric cars. Cheaper driving, cleaner air, less global warming pollution, and secure American jobs. So what's taking us so long to get there? What's Your Favorite Arlington Green Business? Just a quick heads up that the Arlington's Best Business Awards -- a.k.a. the ABBIES -- are taking nominations from the public. The categories include one for Arlington's Best Green Business. Who will be the nominee from The Green Miles? This year, seems like an easy choice -- enviroCAB. But I'd certainly love to hear about a business that's even greener! What do you think? Make your case for Arlington's best green business in the comments. "Nice Planet You're Leaving Me!" Over at GroovyGreen.com, they've dug up a Calvin & Hobbes from 1987 about global warming. Do you think Calvin could've guessed that we'd be sitting here 21 years later with a federal government, Congress and President that still have done nothing to address climate change? From the cynic's point of view, do you think short-term gratification-centered Calvin would have done anything to change his long-term behavior? Did posts over at What's Up Arlington on the coming and going of Tropical Storm Hanna. Couple of cool pictures in the going post, check it out! Heavy rains had washed oil and trash from the lot out one corner and into the grass between the sidewalk and the street, then into the street. There had been a tree at that corner of the grass, but it's long since died and been removed. Gee, I wonder why? The only oil collection method in that corner are some curb-high white tubes. I sent the above picture to Metro asking what they were doing to reduce the oil runoff but never heard back, so I sent the picture to Arlington's Department of Environmental Services. It's a miracle! Everyone stand up and shout hallelujah! 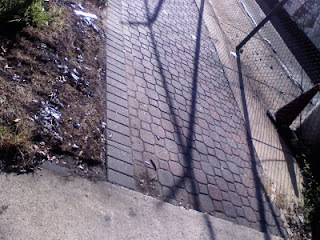 The oil-soaked grass had been replaced, the sidewalk had been washed, and you can see new white oil-collecting tubes next to the wheels of the bus. 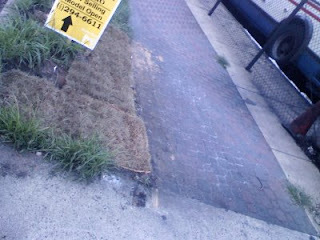 The new grass is oil-soaked and trash-covered again. And when the remains of Tropical Storm Hanna come through this weekend, I'm sure the lot will get a nice power-washing -- with the wastewater going right out the corner of the lot into the storm drain, where it will go straight into an Arlington river or stream untreated, like all of Arlington's storm drain runoff. Metro's feeling seems to be that since the bus lot will shut down anyway in March to make way for a major redevelopment of the block, it's content with what it considers stopgap measures. But as the continuing oil runoff problems show, that gap ain't gettin' stopped. It's up to Arlington DES to decide if and how the problem should be addressed. Seen at the corner of Wilson Blvd. 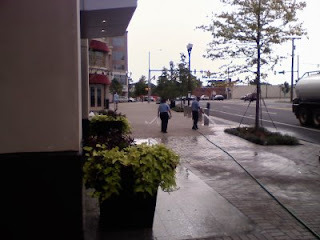 and Randolph St. last Wednesday morning while walking to the Ballston Metro: That's not a power-washing -- the water's dribbling out of the hose. 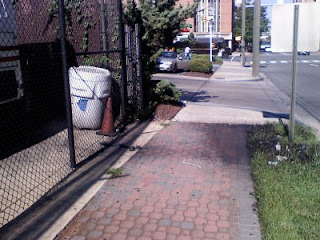 As you can see with the two bits of junk to the right of the planter in the foreground, it didn't clear stuff off the sidewalk. The worker watered the sidewalk all the way around the building -- with some quick-and-dirty math, roughly 6,000 square feet of sidewalk. It's a waste of water, sure. But really, my critique here is an economic one, not an environmental one. Is it really worth paying someone to spend an hour doing this every morning? Or any morning? The American Petroleum Institute and four other business groups filed suit Thursday against Interior Secretary Dirk Kempthorne and U.S. Fish and Wildlife Service Director H. Dale Hall, joining Alaska Gov. Sarah Palin's administration in trying to reverse the listing of the polar bear as a threatened species. The other groups involved in the latest lawsuit are the National Association of Manufacturers, the U.S. Chamber of Commerce, the National Mining Association and the American Iron and Steel Institute. Just despicable. Kassie Siegel, climate program director for the Center for Biological Diversity, which originally petitioned to list the polar bear as an endangered species in 2005, decried the assertion in the Alaska suit that science does not prove polar bear populations are declining. The center is also suing the federal government, seeking to change the polar bear's official status from "threatened" to "endangered." "The amazing thing about this litigation is that the governor of Alaska is so anti-environmental that she is suing the Bush administration over a claimed overabundance of protections for the polar bear," Siegel said. "It's just amazing." If you liked the Bush administration's war on science, you'll love Sarah Palin!